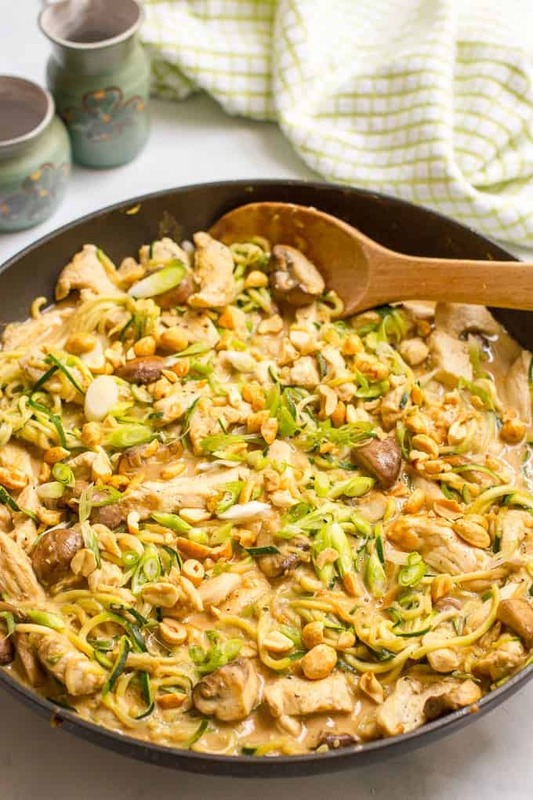 Easy chicken satay with zucchini noodles, mushrooms and an addictive peanut sauce is a crave-worthy one-pot 30-minute healthy dinner! I’m especially happy about this one because I’ve got my annual boat day with my girl friends this weekend. We all bring food and drinks, we load up the boat and go cruise around, stopping to take a dip when it gets hot. We usually pull up to a restaurant for a drink at some point and head back to make dinner together and stay up late watching movies and chatting. We always boat to breakfast at a diner on the lake the next morning before heading home. And has nothing to do with today’s recipe. 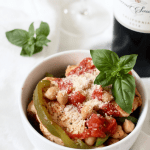 But, I wanted to leave you with one more delicious recipe this week and I’m back with my second month of the Recipe Redux group. This month’s theme is fun fruit and vegetable shapes. And I immediately thought zoodles. 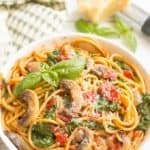 I got a spiralizer last year and have loved experimenting with it! Mostly I make the standard zucchini noodles to stand in for pasta. 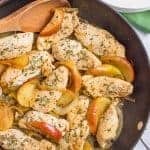 It’s an easy heathy substitute that makes most meals, like this one, gluten free and low carb as well. I’ve also tried out carrots and cucumber (like with my spicy pork fried rice) and next I want to make sweet potato fries with spiralized sweet potatoes. Such a fun tool! 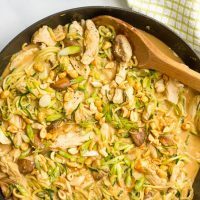 And this easy chicken satay with zoodles is a great way to get started if you’re new to spiralizing. 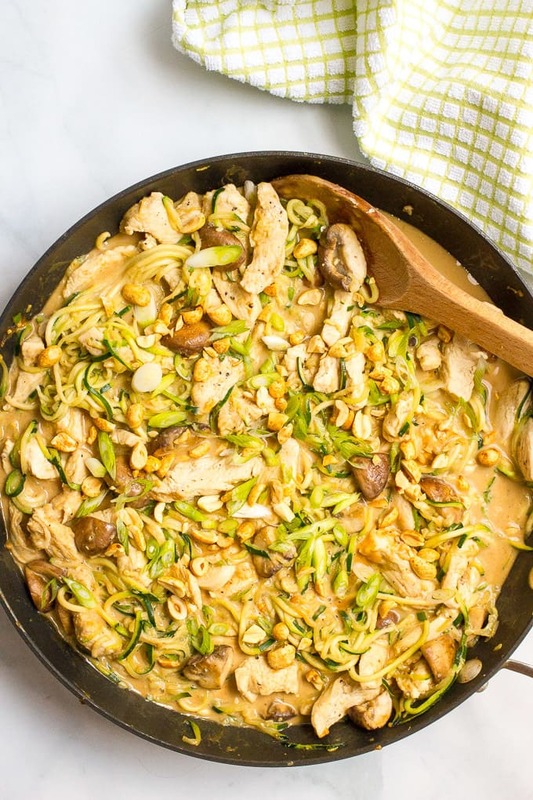 The zucchini is spiralized, mixed into the skillet with the chicken and coated with a creamy peanut sauce that is utterly addictive. You’ll want to make more of the sauce so you can put it on oh, everything! 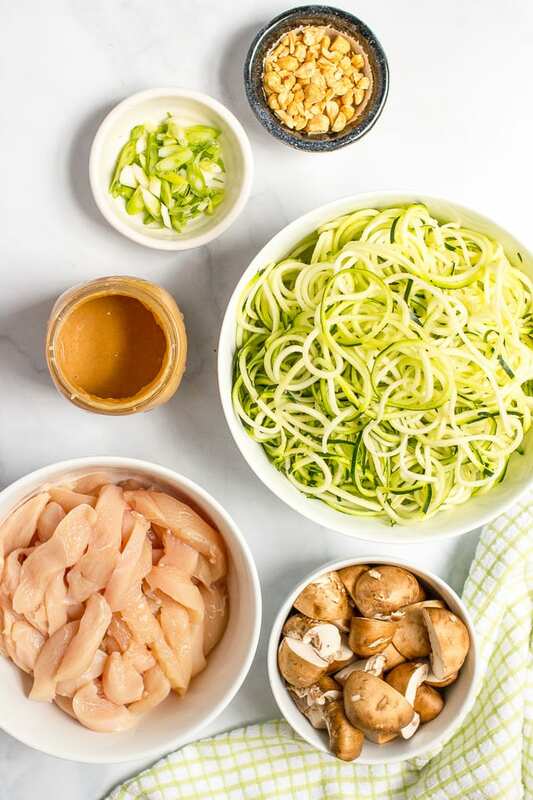 You can do half regular noodles (cooked separately) and half zucchini noodles if your crowd is slow to convert to zoodles as a substitute. You can skip the mushrooms if you’re not a fan. I just love the earthy flavor and meatiness they bring to the dish. I simply shake the peanut dressing up in a mason jar. It’s super easy and allows me to re-shake right before adding. If your peanut sauce gets too thick after mixing it initially, just add another tablespoon or two of hot water and shake it up again before adding it. It should be pretty thick though because it’ll loosen up with all the liquid from the zucchini in the skillet. You can substitute a spicy green chili (or even a jalapeño) if you can’t find a red chili. You also can substitute 1 teaspoon ground ginger instead of using fresh ginger, if that’s all you have. 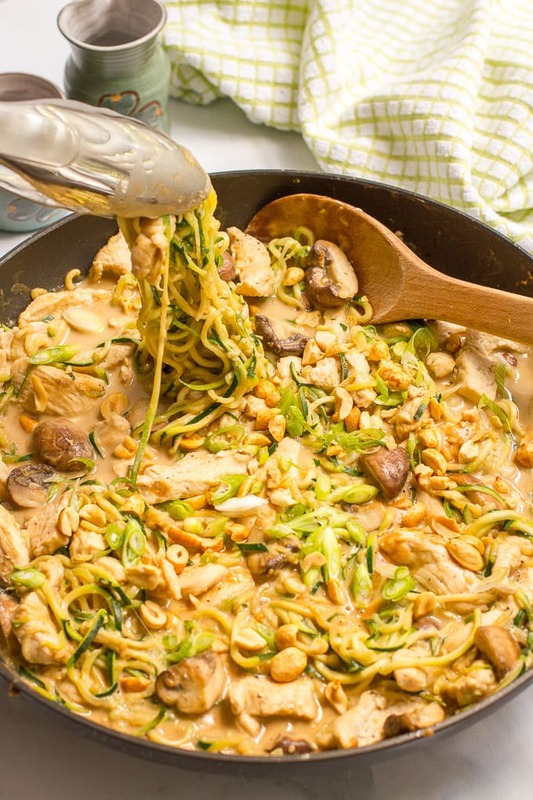 Don’t skip the fresh peanuts on top – they add a great crunch factor to contrast the soft, creamy chicken and zoodles. Also, because I get this question a lot… what if I don’t have a spiralizer? No problem! You can use the shredder blade on your food processor. 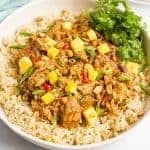 However, this makes small pieces so don’t add them to your pan – just put them straight on the plate and mix with the chicken satay there so they don’t turn to complete mush. Or you can use a vegetable peeler. A julienne peeler is the closest bet but a regular one will work. You just won’t have a noodle-like shape. Also, you can just cut long, thin strips of zucchini with a knife. Just cut in half lengthwise, cut in half again and then cut thin strips. Check and adjust your time so that they get tender in the pan when you sauté them. OK, that was more than a few notes. I just want to make sure you’ve got all the info so you can try this easy chicken satay. What are your favorite fun fruit and veggie shapes? I’d love to hear from you in the comments! 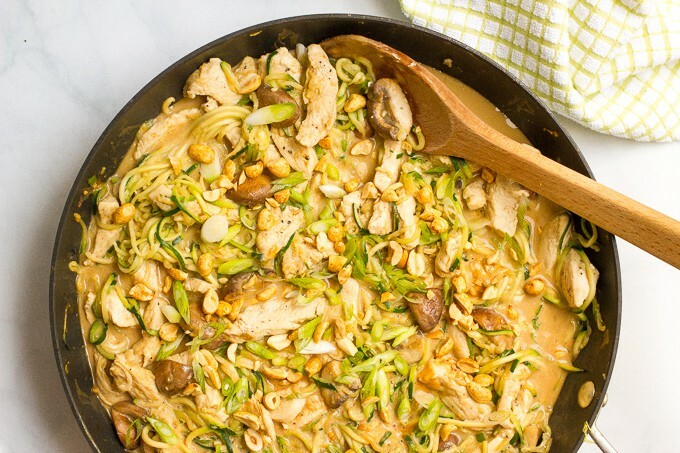 A one-pot, 30-minute easy chicken satay dinner with zoodles and an addictive peanut sauce! Heat 2 teaspoons of canola oil in a large skillet over medium high heat. Add sliced chicken and season with 1/2 teaspoon salt and 1/4 teaspoon pepper. Cook 4-5 minutes, turning occasionally, until chicken is cooked through. Remove to a bowl. Wipe out the skillet (or just dump out any extra liquid that has accumulated) and add remaining teaspoon of canola oil. Add mushrooms and cook 5-6 minutes, until browned and liquid has been released and evaporated. 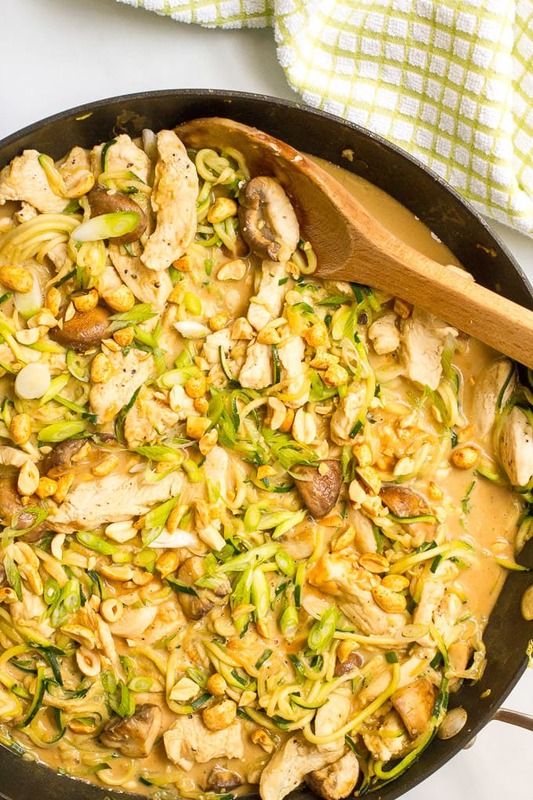 Add zucchini noodles to the panand stir fry for 2-3 minutes. Add remaining 1/4 teaspoon salt and pepper. Taste and adjust seasonings. Serve sprinkled with green onions and chopped peanuts. Add hot water to your peanut mixture to get it mixed to a thick but pour-able consistency. If it gets too thick after mixing it initially, just add another tablespoon or two of hot water and shake it up again before adding it to the pan. It will loosen up with all the liquid from the zoodles in the pan. 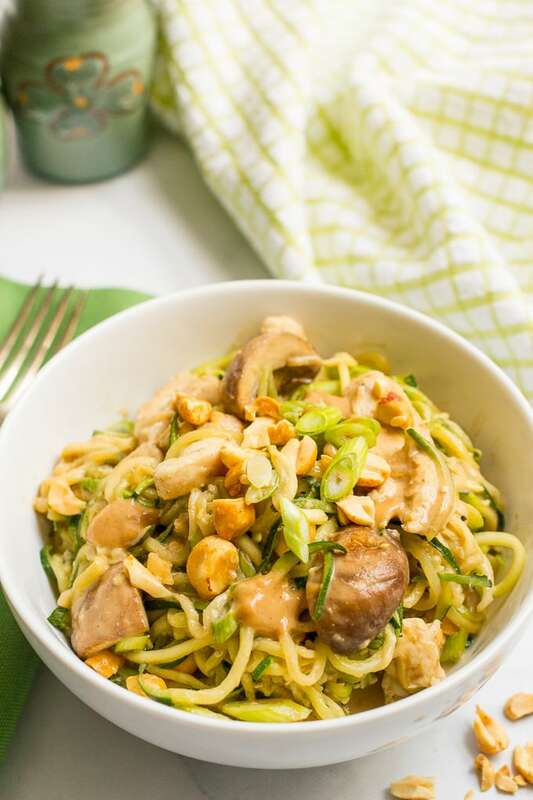 You can do half regular noodles (cooked separately) and half zucchini noodles if you or your family is slow to convert to zoodles as a substitute. O I love chicken satay!!! 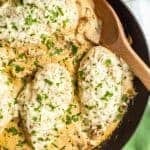 This is such a great all in one skillet meal…so peanutty and creamy! Thanks Rebecca! 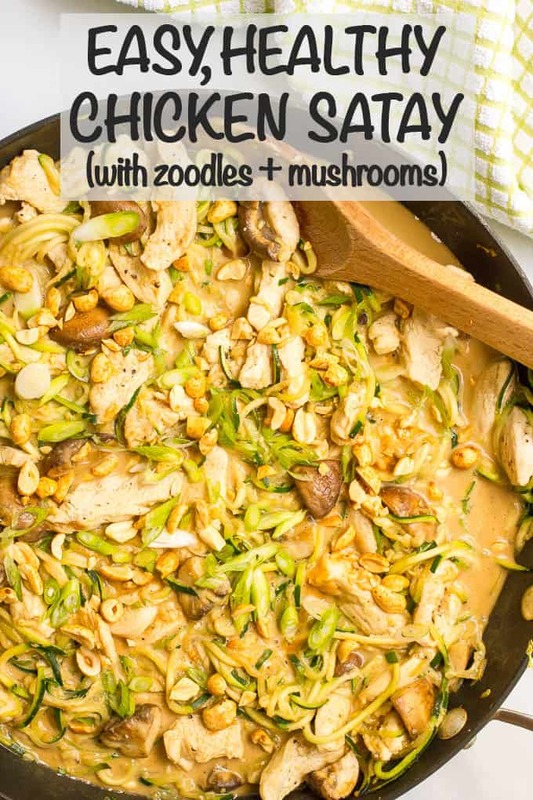 I’m obsessed with this peanut sauce! Sounds like you have quite the fun weekend planned and so much to look forward to!! Chicken Satay is delicious! 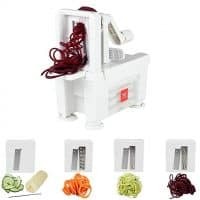 I totally have to get a spiralizer. It’s been on my list to get, but haven’t gotten one yet. I better get on that ’cause I would love to try this recipe! That dressing sounds divine! Thanks so much Dawn! Can’t wait to get on that boat!! This sounds amazing! I wonder if it would be as good with an almond or cashew sauce vs. peanut. Thanks Nicole! It would be a slightly different flavor, but I think you could absolutely make that work! I love chicken satay! 😀 This looks + sounds super tasty (+ I love that it’s done in 30 minutes–those are the best kinds of recipes)! Agree — 30 minute meals are my lifesaver on busy days!! 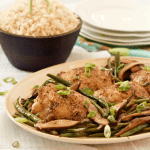 This chicken satay is quick and definitely doesn’t disappoint – hope you give it a try! Hope you had an amazing weekend it sounds so idyllic. I really do have to get ONE of my spiralizers out of the cupboards – geez I have two and never use them there really is no excuse is there? You would have fit in great Karrie! I love satay too and this is an easy way to get my fix! What a great looking recipe. Healthy, delicious and fast are always a winning combination. Thanks for sharing!